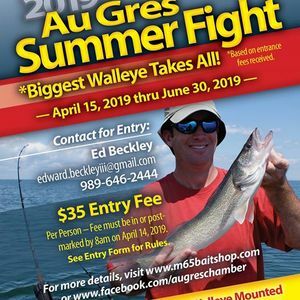 Join us for the 2019 Au Gres Summer Fight! • FISH WILL BE WEIGHED AND MEASURED TO THE NEAREST 1/8TH INCH. 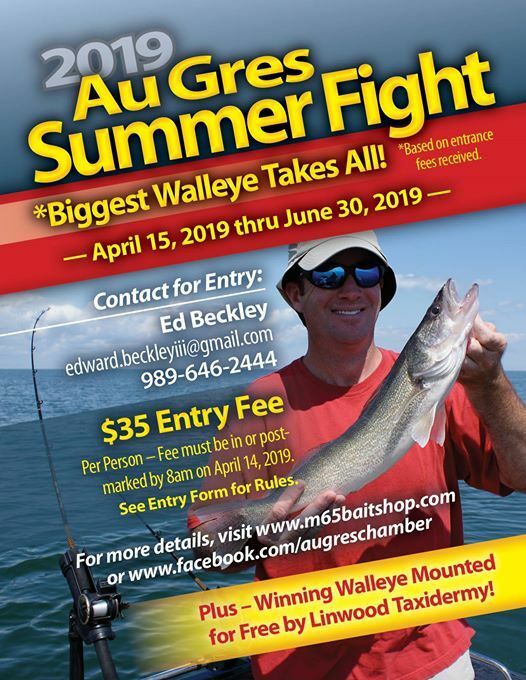 • ALL PARTICIPANTS MUST HAVE A VALID MICHIGAN FISHING License. FISH MUST BE LEGALLY CAUGHT IN ACCORDANCE WITH ALL MICHIGAN FISHING LAWS. • EVENT HELD IN MICHIGAN WATERS OF LAKE HURON, MH-4 WATERS ONLY. • IF FISHING FROM A BOAT, ONLY REGISTERED PARTICIPANTS MAY BE ON BOARD. BOATS MUST BE LEGALLY REGISTERED, LEGALLY EQUIPT WITH ALL REQUIRED EQUIPMENT AND SAFETY DEVICES, AND MUST BE LEGALLY OPERATED. ANY QUESTIONS PLEASE CONTACT: Ed Beckley: Cell: 989-324-7111, SHOP: 989-646-2444 Email: RWR3YXJkICEgYmVja2xleUlJSSB8IGdtYWlsICEgY29t Contestants can sign up online at: www.m65baitshop.com Or by Mail to: M65 Bait Shop II, 302s Main St. Au Gres, MI 48703. 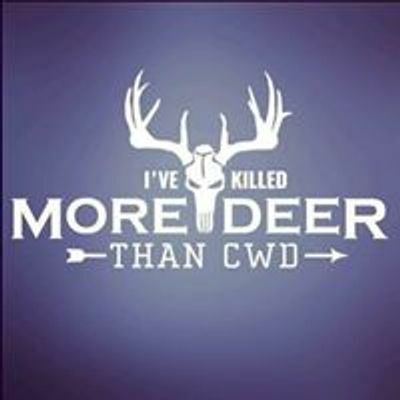 Make all Checks payable to: Au Gres Area Chamber of Commerce In amount of $35.00.